Archdeacon Mark Saunders – Memory Eternal! Having contracted pneumonia last week, Archdeacon Mark was admitted to the Queen Elizabeth Hospital at King’s Lynn, where he reposed in the Lord on 27 November, just over a month after marking his 93rd birthday. Robert William John Saunders was born at Cirencester, Gloucestershire, on 18 October 1925, where his father was a market gardener with a local smallholding. The family later moved to Folkestone in Kent. During the Second World War, as a soldier, he served in both India and Egypt, where he recalled giving support to many refugees. At the end of the war he met Sybil, who was serving in the Land Army and they married at Cheshunt in Hertfordshire in 1945. Having trained as an engineer, he became a General Store keeper and also ran the “Clockhouse Store” at Terrington, as well as a couple of fish & chip shops. From an early age he was a committed and active churchgoer and was an altar server and sacristan at St. Peter’s Church, West Lynn. When their parish priest left the Church of England as part of the “Pilgrimage to Orthodoxy” movement he was among several members of the congregation who followed him in 1993. He and Sybil were baptised and chrismated by the late Father Andrew Winlo at Cusworth on 8 October 1995 and became communicant members of the British Orthodox Church. He was ordained as a Reader (12 November 1995) and Subdeacon (28 January 1996) at the hands of Abba Seraphim and served at the Orthodox Chapel of St. Felix in the African Violet Centre at Terrington St. Clement. In October 1999 he and Sybil were among members of the St. Felix Parish who accompanied Abba Seraphim on his XIXth Visit to Egypt, where they were received by the late Pope Shenouda III. He was always a very efficient handyman and when the British Orthodox Church was offered the use of the former Anglican chapel at Babingley in 2000 he used his practical skills to adapt the church for Orthodox worship. His commitment to the church was always impressive and both he and Sybil twice moved home in order to be closer to the church. 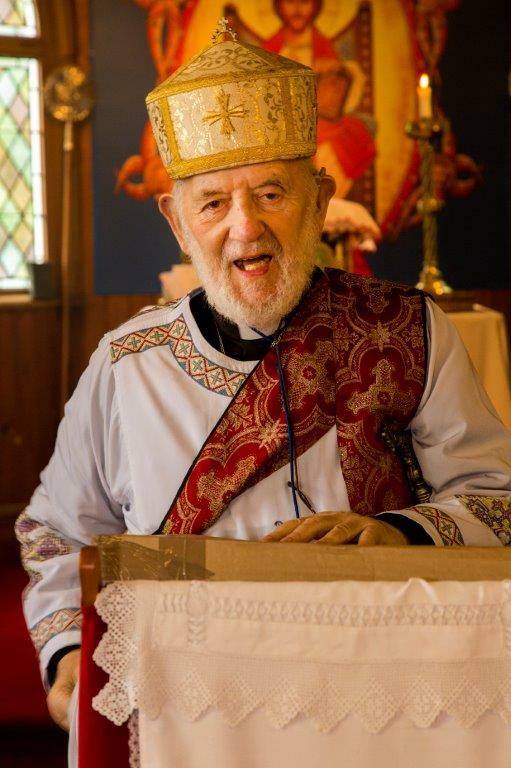 Recognising his gifts and qualities, Abba Seraphim proposed his ordination to the diaconate, which took place at the Eritrean Church in Camberwell on 5 February 2000, when he assumed the religious name of Mark in honour of St. Mark the Evangelist. When their parish priest moved to Scotland in 2007, Deacon Mark became the resident minister in charge of the Parish, whilst Abba Seraphim assumed the direct pastoral oversight by visiting Babingley twice a month between 2007-2015 with Deacon Mark presiding at the regular offices which were held on the other Sundays. On 28 May 2015 Sybil Saunders reposed in her 90th year after long months of declining health, bravely borne, during which she was cared for with great tenderness by Deacon Mark. They were a devoted and loving couple and Sybil’s commitment to the church was as deep as her husband’s. After Sybil’s death Deacon Mark’s own health now began to decline and walking also became an issue, which was very frustrating for someone who had always been extremely active. After the British Orthodox Church resumed its independence in October 2015, Deacon Mark demonstrated his continued loyalty and despite failing health and numbers, he continued to show the same devotion and commitment. When the office of Archdeacon became vacant, Abba Seraphim had no hesitation in raising Deacon Mark to this new dignity, although the blessing was actually conferred in the Queen Elizabeth Hospital at King’s Lynn, where he was for several weeks because of health issues. For many months Archdeacon Mark was in and out of hospitals and care homes, although holy communion was always taken to him after the Liturgy at Babingley. Although physically frail he retained a sharp intellect and sustained his life of prayer. During the past three months, his general condition underwent a marked improvement enabling him to attend all the monthly services, where although he was not able to officiate, he nevertheless joined in with great fervour and devotion and was clearly delighted to be back worshipping at the Babingley Church. A Requiem Liturgy was held at Babingley on Sunday, 2 December. Archdeacon Mark’s funeral service will take place at St. Felix British Orthodox Church at Babingley at noon on Monday, 10 December, following which he will be buried in the churchyard, next to his late wife, Sybil Saunders. Archdeacon Mark Saunders: Memory Eternal !